Monsoon Spice | Unveil the Magic of Spices...: Methi-Lilva-Nariyal Pulao: Bitter is Better! I can imagine most of you either rolling your eyes or twisting your nose when I say “Bitter is Better” :). Yes, bitter is definitely better when taken in moderation just like sweets! According to Ayurveda, India's ancient science of life, health and longevity, there are six Rasas, or types of tastes. These six Rasas are Madhura (Sweet), Amla (Sour), Katu (Hot), Lavana (Salty), Tikta (Bitter) and Kashai (Astringent). This Rasa or taste applies not only to the perception of taste buds located in our tongue, but to the final reaction of food in the acid medium of stomach. The theory says, the taste in the mouth is called Svadu and the taste in the stomach is known as Paka. Although the wheat bread, classified under sweet, doesn’t actually tastes sweet in the mouth but its reaction in the stomach makes it sweet. Thus for good health and nutrition, we have to make sure that we balance our diet by giving equal importance for all six Rasas as needed. Past few weeks I have almost avoided cooking foods that is bitter or astringent which is the required Rasas to balance K’s Pitta and Kapha dosahas. Its not that he hates bitter taste, in fact, he quite like it when taken in moderation. Bitter or Tikta Rasa decreases water retention and it is believed to help in taking away burning and itching sensations. But we should be careful as not to over do it as when taken in excess it can aggravate Vata and dehydrate our body. Similarly, astringent or Kashi Rasa purifies the blood but if taken in excess, it creates gas and constipation problem. So, it is important that we balance our diet but never over do it and create problems to our body! First, try to understand your Dosha and follow balanced diet in order to keep both your mind and body healthy. Let’s explore the vegetables/fruits or ingredients that belong to Bitter and Astringent tastes. Bitter gourd, Japanese eggplants, fenugreek, green leafy vegetables, basil, turmeric, lettuce, aloe vera, jicama are the ingredients that come under bitter taste and apple, pomegranate (which may taste sour or sweet but in fact it is both astringent and bitter), pear, quiona, legumes, tofu, sprouts, beans, lentils etc belong to astringent taste. Surprised? :) Most of the ingredients that may taste sweet/sour/salty are in fact belongs to Kashi or Tikta Rasas. Now you know how easy it is to adopt your diet in order to balance your Doshas (Vata, Pitta and Kapha). Just a tsp of Fenugreek seeds in a pot of stew or curry or half a tsp of turmeric powder, which is considered as good antioxidant and blood purifier, is enough to get more of bitter balancing taste. It has be the simple and inexpensive health habit to increase your antioxidant intake. Try to include some of these ingredients in your daily diet as it is the most simple and inexpensive heath habit to increase your daily antioxidant intake and it will certainly be beneficial in long run! When it comes to incorporating bitter or Tikta Rasa I usually go for green leafy vegetables. And Methi or fresh or dried Fenugreek leaves are my favourite! A tbsp of dried fenugreek leaves, which is also known as Kasuri Methi, is enough to jazz any bland or boring every day Dals. A bunch of fresh, green, mildly bitter fenugreek leaves are enough to awaken your taste buds. 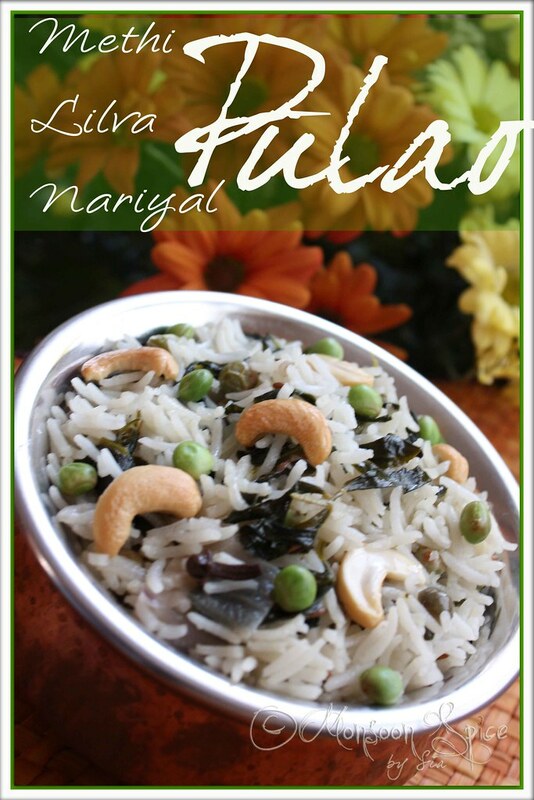 Recently I came across this delightful recipe of Methi-Nariyal Pulao at dear Indira’s Mahanandi. Heat ghee in a thick bottomed pan (I usually use pressure cooker) and add whole spices (cinnamon, cloves, cardamoms, bay leaves & black peppers). Sauté it for a minute or two on low flames till you get the divine perfume of roasted spices in ghee. Add cumin seeds and stir well. Once it starts to crackle, add onion, ginger-garlic paste and green chillies and sauté till onions turn translucent, about 2 mins. Mix in fresh fenugreek leaves and stir fry till the leaves starts to wilt, about 2 minutes. Now you can either proceed to cook in thick bottomed vessel or pressure cooker or microwave oven. I usually cook rice in microwave or pressure cooker. To cook in thick bottomed vessel, mix in rice and sauté for a minute or two till every grain is coated with ghee. Add lilva along with salt to taste and water (about 4½ cups). Cover the lid and simmer the heat and let it cook undisturbed for 20 minutes. To cook in pressure cooker, mix in rice and sauté for a minute or two till every grain is coated with ghee. Add lilva along with salt to taste and water (about 4-4½ cups). Cover the lid, place the pressure cooker weight and reduce the heat to medium. Let it cook for 15-17 minutes or 2-3 whistles. Let the pressure cooker cool little and release the pressure completely before you open the lid. To cook in microwave, transfer the contents from pan to microwave safe dish. To this add basmati rice, coconut milk, lilva and salt to taste. Next add water (about 4 cups should be enough) and mix well. Close the lid and cook it in microwave for 18-20 minutes. Once cooked, let it cool a little before you proceed to mix the rice. This way you will get perfectly cooked rice. 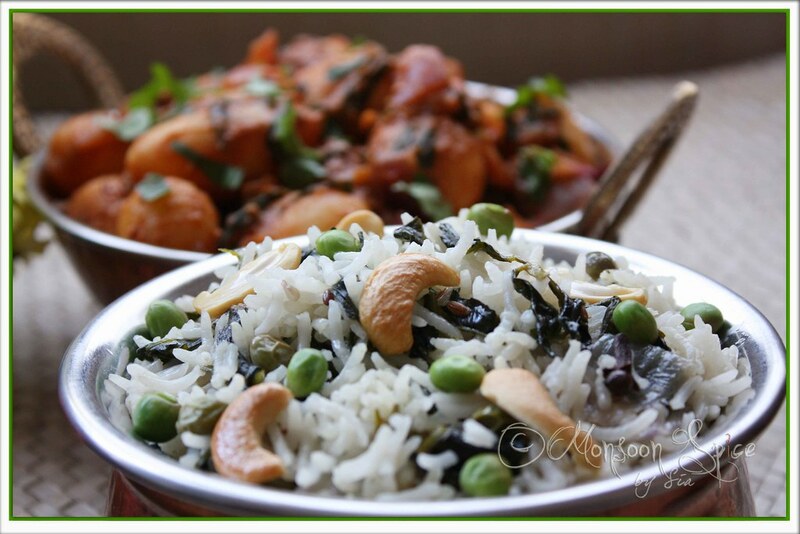 Once the rice is cooked thoroughly, gently mix roasted cashews. Serve this delicious bowl of Methi-Lilva Nariyal Pulao with any spicy Curry of your choice or plain yogurt/raita and enjoy. Replace pigeon peas with green peas. Next time I am thinking of using my current favourite Black eyed peas soaked in water overnight as I quite like the combination of Methi and Chavli. The choices are many and experiment with them. Most of the points used in this article are taken from the Maharishi Ayurveda news letter. This is a must try dish I feel now..Pics are amazing AS USUAL. Superb Sia.. I don't have much knowledge of ayurveda but your write-up makes me want to know more. I never thought of the reasons for adding adding turmeric or methi seeds in a dish.. I just did it, since my mom does it. it is interesting to learn the actual facts. Thanks Sia. Wow, really today i came to knw a lot of things abt wat to add to our daily diet !! Nice post Sia.. We have to balance wata-pita-kafa.. 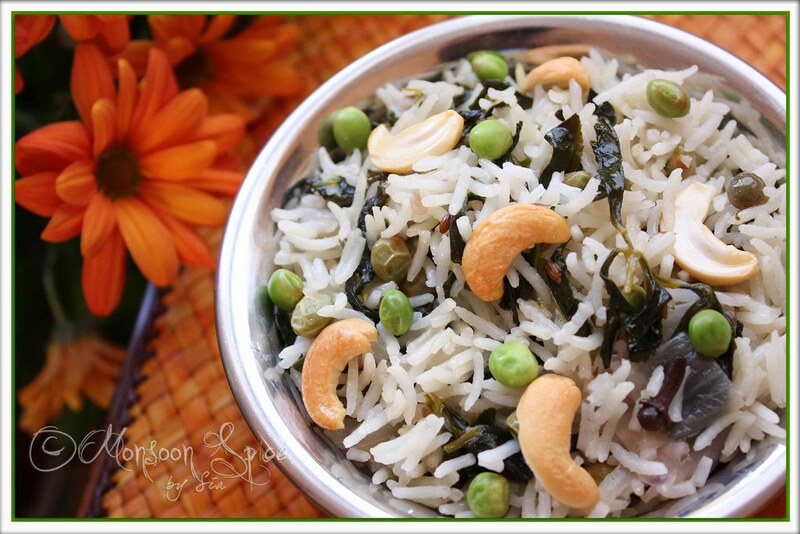 This rice looks so gud with methi, lilva an coconut, shall try as i have a bunch of fresh methi !! Wow, so many tastes together in one rice item! Looks gorgeous and mouth-watering Sia! Well, It's a beautiful rice dish! U know what U re killing me with the pic! I just want to grab a spoon and go on! On my list the next time I get a fresh bunch of fenugreek ! sounds perfect! Very sweet of u to write down various ways of cooking the pulao :) The snaps look amazing and love the clarity...just superb. ok , ok, ok, your theory for " bitter is better" I accept :) (how could I convince the opposite after reading 52 lines of explanations on these methi leaves and the " Tikta Rasa " and how it plays on our " Dosha", wow, wow, wow....lol good work! Your pulao looks simple, elegantly displayed and appetizing. I cannot leave without appreciating the work of your clicks, and the dispositioning of the 4 casseroles with the ingredients, neat and lovely presentation. Very informative Sia, I make methi pulav too, but never tried with coconut milk. Your pics, as always, are brilliant ! That was a lovely presentation! so much info and a great recipe. cheers! Hmmmm.... The beautiful aroma says about the dish.. Delicious! Nice click asusual! Lovely pictures Sia...and beautiful post very informative! aah, lovely rice! And a unique combo.. I agree, to incorporate bitterness, I would go for healthy leafy veggies! Got to try your rice soon..
such a flavourful dish, Sia!! 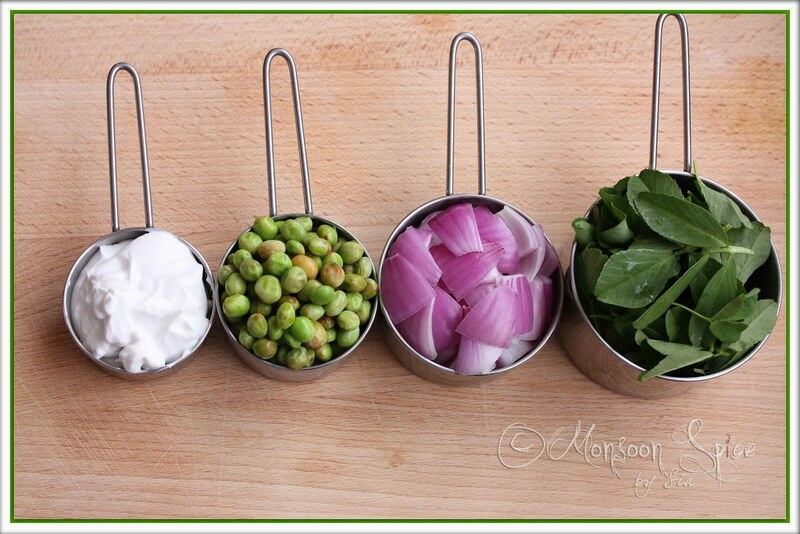 loved that pic of the ingredients in the measuring cups. informative posting, and lovely pulao. My eyes and nose are just as they are while I'm reading this. :) I'm not sure that bitter is better, but I'll definitely agree that its good, though my husband and daughter wouldn't agree. The rice does look delicious. I made this pulao long back and it was bitter but I loved it.The flavor of coconut milk and methi is oh-so good. You are very rite about the 6 tastes mentioned in ayurveda.My grandma always talk about this. You always inspire me to take good photos!